Today, AMD has launched a brand new driver for those with a Radeon GPU. 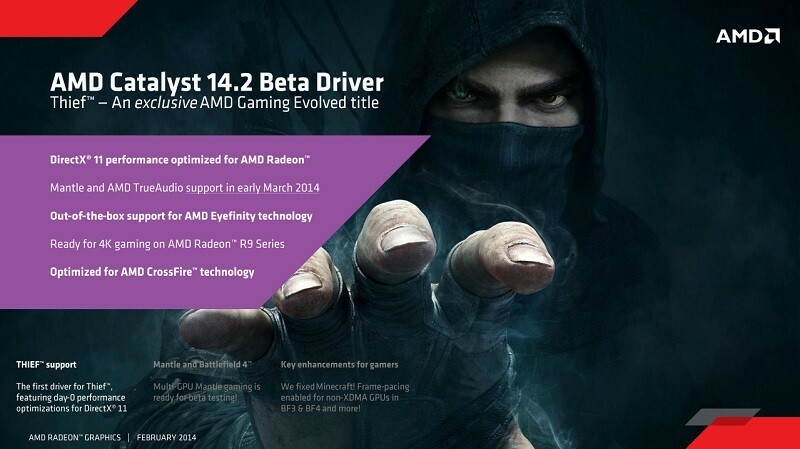 The Catalyst 14.2 Beta driver is geared towards supporting Eidos Montreal's Thief, which launches today in North America and has been optimized specifically for AMD hardware. Right from the start, Thief will support 4K gaming, Eyefinity, CrossFire and a range of graphical effects that both AMD and Nvidia users can benefit from. This includes shader-accelerated depth of field effects, silhouette-enhancing tessellation, complex shadowing, and SSAA. AMD claims Thief performs better on their hardware when compared to competing Nvidia products, and provides figures to back it up. For example, the Radeon R9 290X has a 5 FPS performance advantage over the GeForce GTX 780 Ti when gaming at 4K resolutions on Very High Quality settings, according to their data. We'll be testing Thief in the coming days to see if AMD's claims are in fact verifiable. Other updates in the Catalyst 14.2 Beta driver include fixes for the Mantle codepath in Battlefield 4, resolving issues with multi-GPU setups, and frame-pacing support in both Battlefield 3 and 4 for multi-GPU, non-XDMA users running the games at high resolutions. AMD has also improved their open source Radeon Linux drivers, packing in new features including the Video Compression Engine (supporting hardware-accelerated H.264 encoding of 1080p60 content), video and 2D acceleration via the GLAMOR library, tiling support on GCN products, and an OpenGL feature level upgrade to 4.3. The Catalyst 14.2 Beta driver is available for download here.